Most damage to the windshield of your car or truck happens gradually over the course of ownership. Small particles, rocks or flying debris constantly strike your windshield. Although automakers install strong safety glass, the glass will eventually give in to damage. A small hole will turn into a much larger problem. When you notice windshield or window damage, PG Chatsworth auto glass repair specialists should be your first call. Part of vehicle ownership is having certain professionals on standby when problems occur. Most people have a plan for general repairs for breakdowns or collision damage. Auto glass repair is important and a plan should be in place for emergencies. PG Chatsworth auto glass repair technicians come to you 24/7 to fix or replace damage to your front, side or rear automobile windows. Fixing damage to a portion of your auto glass is only one side of the solution. A broken window needs a total replacement. A window is one of the most commonly damaged areas during a collision or accident. Finding after hours repair services for auto glass repair in Chatsworth does not have to be an issue for residents that select PG Auto Glass. Families that travel frequently are at increased risks for automobile damage. This damage can be the result of unforeseen accidents on the road or at the place of arrival. Traveling to new areas brings an uncertain level of safety and vandalism may happen. A broken or cracked windshield can cause extended travel delays for a family on a tight schedule. PG Auto glass repair in Chatsworth specialists bring mobile auto glass repair directly to stranded families. Businesses that depend on pickups and deliveries can be sidelined quickly with damage to the glass of business vehicles. PG Chatsworth auto glass replacement specialists come directly to offices, parking lots or highways to restore glass quickly. These emergency services benefit the supply chain and reduce the disruptions for delivery of products and services. 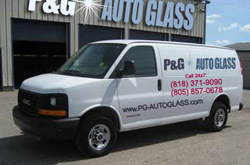 PG auto glass replacement in Chatsworth is the leader in mobile auto glass repair. Are you looking for a reliable auto glass repair and replacement service in Chatsworth, CA in zip codes 91311, 91312 and 91313? Contact PG Auto Glass for all your auto glass repair and replacement needs.